decor8 + Couch Twitter Party: Online Thursday Aug 29th! On Thursday, August 29th (that's tomorrow, word!!!) 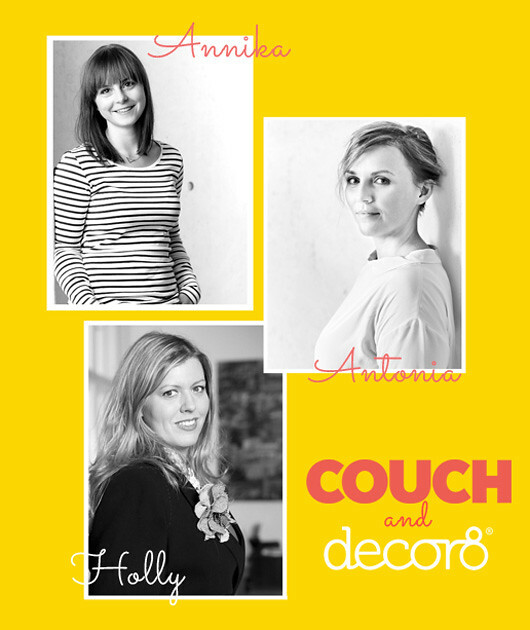 TODAY, August 29th, I will be on Twitter for about one hour along with Antonia Michael and Annika Kapischke, the editors of COUCH magazine (a gorgeous home/fashion magazine in Germany) for a bilingual chat about decorating, styling and even some tricks for bloggers who want to shoot their homes for their blogs. I can't wait to tweet up with ya! 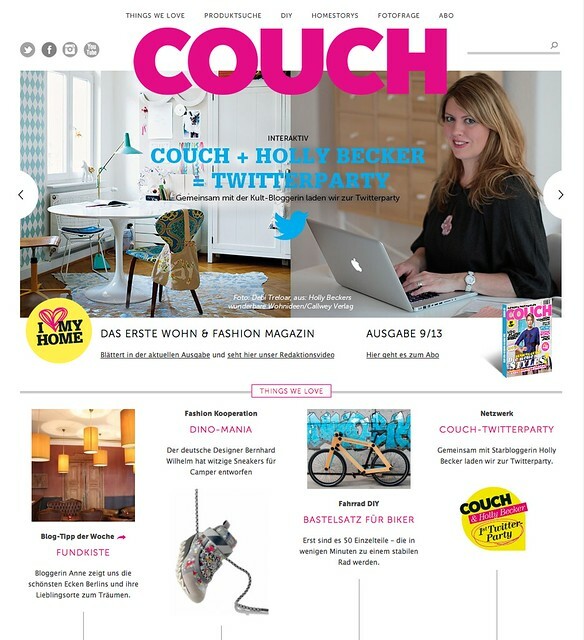 So please join us on twitter and follow hashtag #decor8couch - you will see lots of tweets from the editors (@CouchMagazin) asking me (@decor8) questions and of course, you can jump in and take part, too! In fact, we want you to get involved! ALL WHO PARTICIPATE in our chat will automatically be entered to win a FREE SEAT in the next Blogging Your Way e-course (a $129 value) that will run in October/November and is dedicated to styling, photography and blogging! I'll announce the winner on decor8 later this week! Here are some of the questions we will cover - so if you want to prepare in advance with your own answers, please hop in to add your thoughts. As you tweet, please use hashtag: #decor8couch and put the question number in front of your answer so there is no confusion. You may reply in ENGLISH OR GERMAN only please. I will be tweeting in English. Q U E S T I O N S: 1) Where do you find ideas and inspiration? / Wo findet Ihr Ideen und Inspirationen für Euer Zuhause? 2) How can you develop your personal style? / Wie entwickelt man seinen eigenen Einrichtungs-Stil?) 3) What are some tips on how to style & photograph your home that would be helpful for bloggers? / Holly - hast du als Stylistin und Bloggerin Tipps, wie man sein Zuhause optimal für den eigenen Blog fotografiert? 4) What makes a room perfect? / Was macht für Euch einen Raum perfekt? 5) Little changes, huge effect – how can you make small rooms look larger on a budget? / Kleine Änderung, großer Effekt – wie verändert man kleine Räume mit wenig Budget? So your never miss a tweet and our fun party, please try TweetDeck, TweetChat or HootSuite. These dashboards and apps will help you keep track. Simply register, create your own column with the hashtag #couchdecor8 and you can see the tweets and the party can start. Couch will also be summarizing the tweets and putting together an article about our chat, so make sure to join in as your tweet may stand out and they just may mention something clever you've said! In fact, I'm sure they will! Martha Stewart American Made: Vote!